This Saturday we're exploring the "Wonders of Science and Technology" at our reading clubs! If you are not signed up with us already, sign up today, then join our November 8th Facebook Event. If you signed up but cannot join us after all, be sure to cancel online to open your spot for someone else. The deadline for canceling is 3pm tomorrow. November is also our College Spirit month, so be sure to wear your college's logo. The competition is on to see which college has the most volunteers representing their alma mater at the November 8th reading clubs! JOIN OUR ANNUAL FUND DRIVE! At this Saturday's reading clubs, every volunteer will be invited to donate to our 2014 Annual Fund Drive by cash, check, or credit card. This year we've set a goal of raising $45,000 from 500 donors. We have already raised $10,809 from 131 donors! You can see all of their names on our 2014 Annual Fund Drive page. Join them by donating! Although our main source of funding is grants from foundations and corporations, support from individual donors is vital to us. Our large number of donors demonstrates to foundations and corporations that we have broad support in the community, which in turn prompts them to support us, too. If your workplace matches donations to nonprofits, please share with them your donation, and ask them to consider matching it. 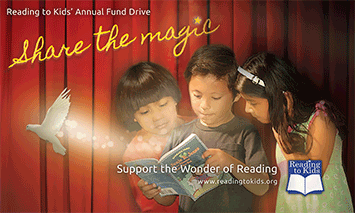 In this way you double the value of your donation and share with others your enthusiasm for Reading to Kids! Last year an anonymous donor matched the first $500 of donations made at the October reading clubs at Alta Loma Elementary. This meant that anyone reading and donating at Alta Loma that Saturday had their donation doubled! If you or your employer is interested in doing something similar, please contact us - a matching donation can be an exciting way to inspire others to donate! For the 10th year in a row, IBM Corporation has generously donated to support our monthly reading clubs! Our sincere thanks to both IBM and Mark May, Site Coordinator at Esperanza, for this year's $2,000 grant. Working together, hundreds of kids in Los Angeles will grow up in homes where books line the shelves. Thanks, and we hope to see many of your colleges represented on Saturday!